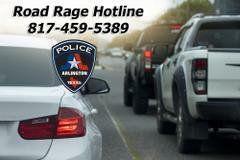 The Arlington Police Department has a new road rage hotline to report aggressive drivers. This hotline is not a replacement for 9-1-1. Motorists finding themselves involved in an in-progress incident with an aggressive driver should still call 9-1-1. The telephone number for the road rage hotline is 817-459-5389. The purpose of the road rage hotline is to provide follow-up communication with registered owners whose cars have been reported to be involved in an aggressive driving incident. Callers to the hotline should provide their contact information, a detailed description of the aggressive driver and vehicle involved, a general description of what happened and a location and time of the incident. By providing a license plate of the alleged suspect vehicle, investigators from our Traffic Unit will follow-up with the incident. A letter will be mailed to the registered owner describing the allegation and provide tips on how to remain calm in traffic and safely diffuse future incidents. The Arlington Police Department had a road rage hotline in the early 2000’s but the program was discontinued in 2008 after calls quit coming into the hotline. The department launched an aggressive driving task force after the death of a 19-year old man on June 25, 2017. Task force officers work in covert capacities as well as marked units to detect, apprehend and enforce laws on roadways within the confines of the city of Arlington. Officers look for aggressive drivers including excessive speeding, tailgating, unsafe lane changes, driving on improved shoulders to pass traffic, throwing objects at vehicles, brandishing weapons and other unsafe behaviors that can lead to road rage style incidents. Since inception of the task force, 19 team enforcements have been conducted which have resulted in 464 traffic stops, 574 citations issued, and seven arrests.